STEVE Hislops lead in the British Superbike series has been shaved by three points to 10 following two thrilling races at Thruxton in Hampshire on Sunday. After an amazing run of form, the warning lights came on early for the MonsterMob Ducati rider when he was pipped to pole position in qualifying by Kawasakis Steve Plater. 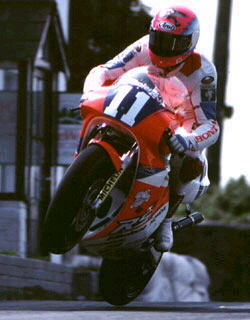 That cost Hislop a cool £10,000 as he was in line for the special bonus for claiming four consecutive SuperPoles in a row. Nevertheless, second place on the grid was still an ideal place to start from in race one and he was soon on a charge. An overshoot at the chicane saw him drop down to seventh place, but he clawed his way back into contention and as six riders squeezed into the same Club chicane on the final lap saw the Onchan based Scot went from fourth to first in one sweet manoeuvre and grab his first ever big bike honours at the circuit. But in an equally exciting race two a bid to carry out a carbon copy move at the last corner failed and Hislop trailed home in sixth place on the tail of the leading pack. It was a lottery out there and I guess I hit the jackpot in race one but I must have lost my ticket in race two, said Steve.